This section gives an overview of the responses of the website to a request. Here, it gives the summary of the response code series like 200s, 300s, 400s etc occurred in the queried domain. These series are differentiated by different colors. It gives the time taken by a website to perform an HTTP GET (a command) to a specified URL. 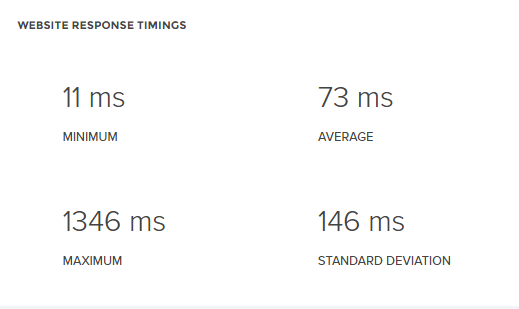 Here, we show the minimum, maximum, average response times along with standard deviation. This table gives all the details like Response codes, Images, External Links etc. in a page(URL). Let’s go through each column. URL - Here you’ll see the URL of the page in the queried website. 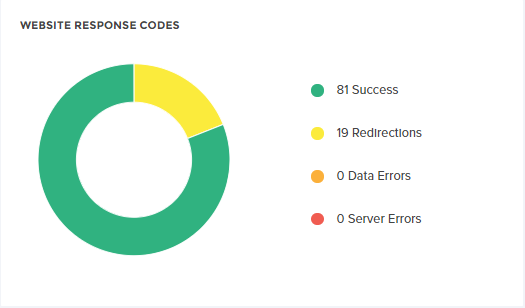 Response Code - Shows the response of the page (URL.) The user can optimize the pages with 400, 500 responses. Page Size - Shows the size of the page. Internal Links - Shows the number of internal links. External Links - Shows the number of external links. Content Type - Displays the type of content. This is used to indicate the media type of the source.